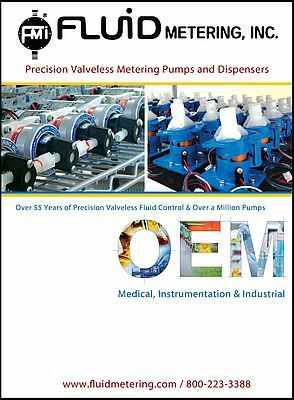 For over 55 years, Fluid Metering (FMI) has supplied over one million pumps for OEM applications in medical, analytical, industrial device & instrumentation markets where Ultra-Precise Fluid Control from Microliters to Liters is required. The OEM pumps are typically miniature versions of their standard valveless piston pump design driven by compact stepper or brushless DC drive motors. However, several models are available which enable the user to integrate FMI valveless CeramPump® technology with their existing or preferred drive. - The ICST02 Intelligent Driver Board complete with programming software for controlling all FMI stepper pumps. - The Intelligent Stepper Pump, which integrates the FMI intelligent driver with the STH Stepper Pump in a compact, integral configuration. The pumps feature only one moving part in the fluid path, inert ceramic internals, and FMI's unique CeramPump® valveless piston pumping technology. Elimination of valves and the use of sapphire-hard ceramics results in a pump that will deliver millions of dispense cycles at 1% precision or better. This minimizes downtime or the need for recalibration. Maintenance-free operation is extremely important for OEM components, as they are installed in equipment that will be shipped to locations worldwide often in places costly to service.